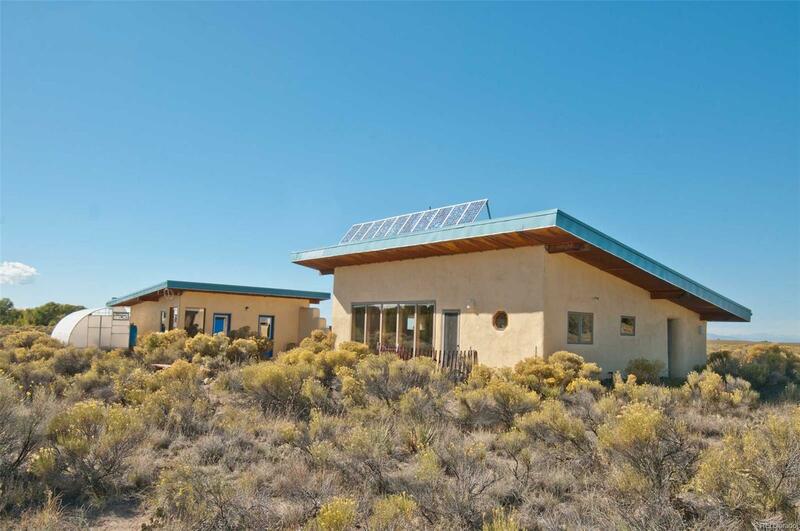 This 2Bed/1Bath off-grid strawbale home is warm, welcoming & highly efficient - built by a solar professional. Adobe floors & attractive stone trombe wall provide thermal mass to radiate heat from the sun or wood stove. Open floor plan w/ tall windows provides both amazing views and solar gain. Insulated window coverings keep heat in at night. Includes wood stove, partial in-floor radiant heat, solar PV, & propane heater. 12 sealed maintenance-free Sun Xtender AGM batteries installed in 2016. System is wired for windmill & includes gas-powered Generac backup generator. A 33' (855 sf) grow dome with rock planters is ready for your dream garden, w/ additional 8x12 solar greenhouse. A 440-sf detached shop/studio offers a guest room w/large windows & adobe floors as well as separate finished studio/shop/living area w/ wood flooring. All this sits on pvt 8.78-acre parcel with mountain/valley views and Cottonwood creek on the property! A very special home w/privacy & sustainability galore!